Many of our clients at ThoughtWorks are building internal services for development teams to use in developing, delivering, and running applications. I’m often asked what the model for this should be in terms of developer experience. Should developers be able to write their own infrastructure code? Should they package up and release their own Docker images on infrastructure that’s built for them? I believe a layered approach is best. Teams should be able to reach for the level of tooling that suits their needs and capabilities. If there are solid services available within the organization, then they should be able to re-use those. If not, they should be able to use lower-level services provided for them, and follow examples and templates from other teams. If none of these exist, they should be able to build their own, following shared principles, policies, and governance. I prefer to just write my application code and push it to something that will run it. This is the serverless model, as well as the “build-pack” model used by Heroku and some PaaS platforms. If that’s not available or appropriate for my needs, then I prefer to package my code and runtime and push it. This is the container model, with a container orchestration service like Kubernetes or Nomad already available and running. If that’s not appropriate, I prefer to push my package with standardized Infrastructure as Code. That is, someone else has written infrastructure modules and/or code that I can grab and use to provision the infrastructure my application needs. If that’s not appropriate, then I prefer to write custom Infrastructure as Code in a standard tool (like Terraform, CloudFormation, etc.). If that’s not appropriate, I want to have an API (e.g. REST-based) so that I can write custom scripts. A given application might rely on multiple platform services, some of which may be provided in different ways. For example, maybe I can write application code and push it to the platform to package and deploy it for me (#1), but I may need to write infrastructure code to provision and configure a database using a DBaaS model (#3), that my application connects to. Clearly, #1 is the slickest thing to offer to your development teams. But it’s not practical to think your organization can provide this level of experience for everything every team will need, unless your needs are very simple. In practice, centralized teams are best off first providing services in the simplest way possible, which will tend to be APIs, hopefully ones supported by standard tools. Typically this happens by installing packaged software, and by opening up access to public cloud and SaaS accounts, and giving teams access to go ahead and configure and use these according to their needs. Then, central teams can focus on incrementally building shared services which have the most commonality and value across teams. This incremental approach is essential to avoid the all-too-common Big Platform Programme. These involve spending piles of money, and months and years of time, followed by the release of an underwhelming “MVP”, typically heavily restricted and limited. The result of this kind of platform strategy is that teams working on high profile projects persuade their executive sponsors to approve them going directly to public cloud. Meanwhile teams on lower profile projects remain on legacy platforms. Shared managed service. As a product team, I can just interact with something that someone else keeps running. This is essentially SaaS, the true cloud model. Variations of this are a shared, multi-tenant service - all the customers are using a single instance of the service, vs. self-provisioned service. The latter is like a public cloud DBaaS database, where you can provision your own database instance. Either way, you will interact with it using one of the developer experience models described above. Shared service package. As a product team, I can spin up and run an instance of the service for myself, using a package provided for me. I am responsible for keeping it running, upgrading it, etc. This is essentially the packaged software model, although within an organization the package is probably more customized. An example is a server OS build, that has been hardened, had standard agents for monitoring etc., pre-installed. Shared code. As a product team, I can use code, templates, libraries, etc. that have been provided for me. For each shared code project, a central team provides a certain standard of support, manages versions, keeps it updated, etc. Example code. As a product team, I can copy code, templates, etc. from other teams. Those teams don’t commit to support me, won’t worry about releasing updates that will be easy for me to apply to my things, and may not even keep the code maintained. Principles, policies, and patterns. As a product team, I can write my own code to provide a service I need. I should follow shared principles (e.g. “Define infrastructure as code”), must follow policies and governance processes, and may follow patterns. As with developer experience patterns, these can be built up incrementally from the bottom levels up. First, define common principles, policies, etc. that anyone who is building services should or must follow. Then, as teams begin building their own services, make it easy for them to share their code with each other. Identify services which are most commonly used, and build more maintained code libraries for those. Consider packaging them up so that teams can use them more easily. For some things which are very common, create managed services. Rather than trying to define all of this up front, an evolutionary strategy allows services to emerge organically based on what is most important. Building shared services incrementally is more pragmatic, and creates value and feedback more quickly, than attempting to build a Big Platform Up Front. This is a fairly big and complex topic. But briefly, I usually encourage organizations to avoid having a single big platform team, preferring multiple teams organized around concerns that hang together. Companies like Netflix, Spotify, and Etsy, who are all pretty good at this stuff, tend to have teams such as compute, observability, traffic, etc. This encourages building a collection of loosely coupled services and capabilities, as opposed to monolithic “platforms” which quickly become legacy. These teams should also focus on building (and in some cases running) things for other teams to use, rather than using them for the other teams. 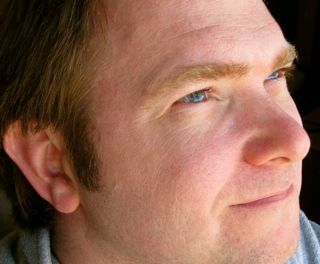 For example, the conversation should not be, “Hey monitoring team, can you add some monitoring checks for my application?” Instead it should be, “Hey monitoring team, how do I add monitoring checks for my application?” The monitoring team keeps the monitoring service running, and provide support and help to teams who need it. The above is not official ThoughtWorks gospel, although it’s probably fairly well aligned. A bunch of smart ThoughtWorkers have defined and offer a more structured engagement model for clients working on platforms, the Digital Platform Strategy. Thanks to current and former ThoughtWorks colleagues Peter Gillard-Moss, Karl Stoney, Moritz Heiber, and Bill Codding, for the email thread that spurred me to describe my thoughts on this. Particular thanks to Peter for encouraging me to blog it. The term Infrastructure Stack is something I’ve found useful to explain different patterns for organizing infrastructure code. An infrastructure stack is a collection of infrastructure elements defined and changed as a unit. Stacks are typically managed by tools such as Hashicorp Terraform, AWS CloudFormation, Azure Resource Manager Templates, Google Cloud Deployment Manager Templates and OpenStack Heat. AWS CloudFormation uses the term “stack” formally, but it maps to other tools as well. When using Terraform, which I tend to use for code examples, a stack correlates to a Terraform project, and a statefile. A stack definition is the code that declares what a stack should be. It is a Terraform project, CloudFormation template, and so on. A stack definition may use shared infrastructure code - for example, CloudFormation nested stacks or Terraform modules. This stack is part of my standalone service stack template project in github. A stack definition can be used to provision, and update, one or more stack instances. This is an important point, because many people tend to use a separate stack definition for each of their stack instances - what I called Separate stack definition for each environment in my post on environment pipelines. But as I explained in that post, this approach gets messy when you grow beyond very simple setups, particularly for teams. I prefer to use a single, parameterized stack definition template, to provision multiple environment instances. A properly implemented stack definition can be used to create multiple stack instances. This helps to keep multiple environments configured consistently, without having to copy code between projects, with potential for mistakes and mess. Nicki Watt has a great talk on Evolving Your Infrastructure with Terraform which very clearly explains these concepts (and more). One of the pain points of using Terraform is dealing with statefiles. 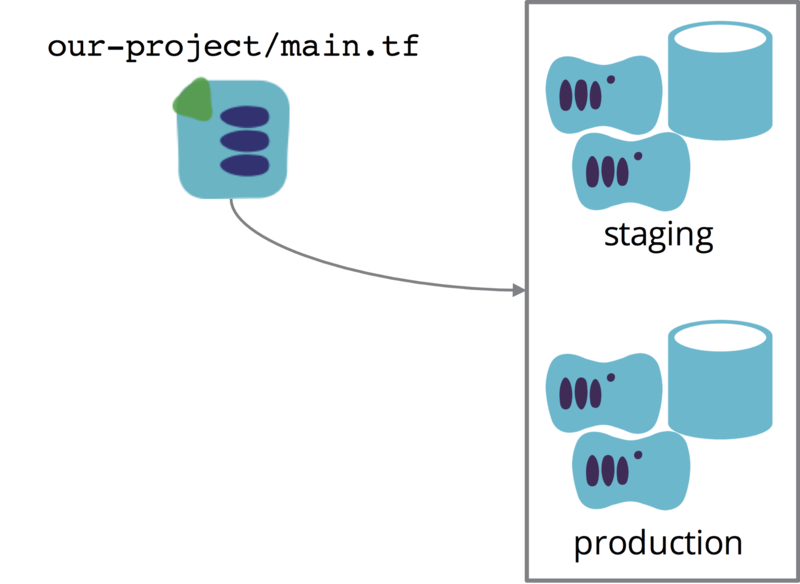 All stack management tools, including CloudFormation, etc., maintain data structures that reflect which infrastructure elements belong to a given stack instance. CloudFormation and similar tools provided by cloud platform vendors have the advantage of being able to manage instance state transparently - they keep these data structures on their servers. Terraform and other third party tools need to do this themselves. Arguably, the explicit state management of Terraform gives you more control and transparency. When your CloudFormation stack gets wedged, you can’t examine the state data structures to see what’s happening. And you (and third parties) have the option of writing tools that use the state data for various purposes. But it does require you to put a bit more work into keeping track of statefiles and making sure they’re available when running the stack management tool. I have an example of a parameterized infrastructure stack project on github, using Terraform and AWS. Below is a (trimmed) snippet of code for a webserver. This shows how it a number of variables are used to set tags, including a Name tag, to distinguish this server instance from other instances of the same server in other stack instances. The codebuild project simply runs make up, and our stack definition creates our webserver instance accordingly. The examples I’ve given imply each environment is a single stack. 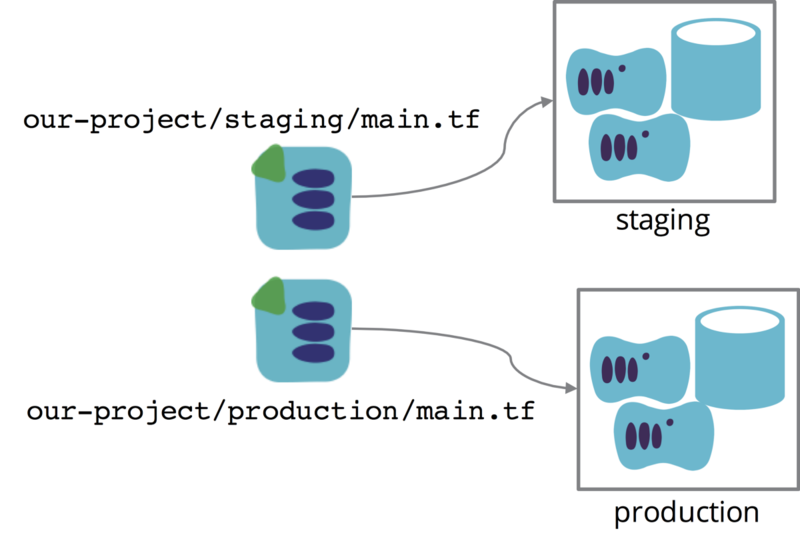 In practice, as environments grow, it’s useful to split them into multiple, independently managed stacks. I’ll elaborate on this in future posts. 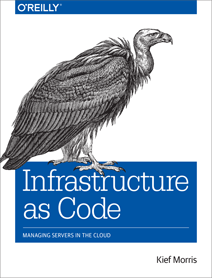 Infrastructure as Code is officially published! 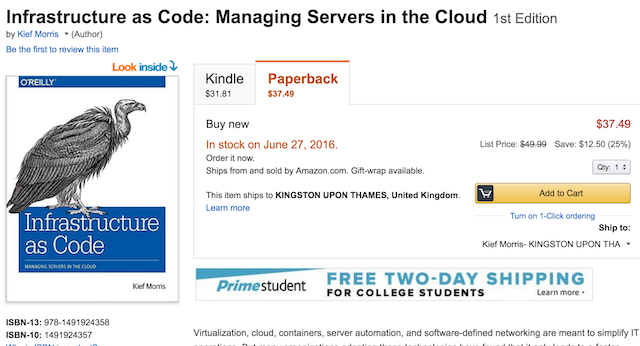 The “Pre-order” buttons on Amazon.com and the O’Reilly shop have flipped to “Add to Cart” for both print and e-book formats. I’m told that “boxes and boxes” of the book have arrived in the ThoughtWorks office, although I’m not in today so I don’t have my greasy mitts on a copy yet. Links to various sites to order the book are over on the right of this page. This book has been a long haul. It’s hard to express how important the support of so many people has been. ThoughtWorks has been incredibly supportive, on so many levels. I doubt I would have done it without the examples and inspiration of my amazing colleagues across the globe. Martin Fowler has been a tremendous mentor. Rong Tang did the artwork, showing infinite patience as she turned inconsistent, muddled, and incoherent scribbles into great looking imagery. I owe a great debt to the people of the DevOpsDays community, who are collectively responsible for the ideas of DevOps and Infrastructure as Code. I took a stab at collating what I’ve learned from many peoples’ ideas and experiences into something that hopefully will help other people as much as this community has helped me. 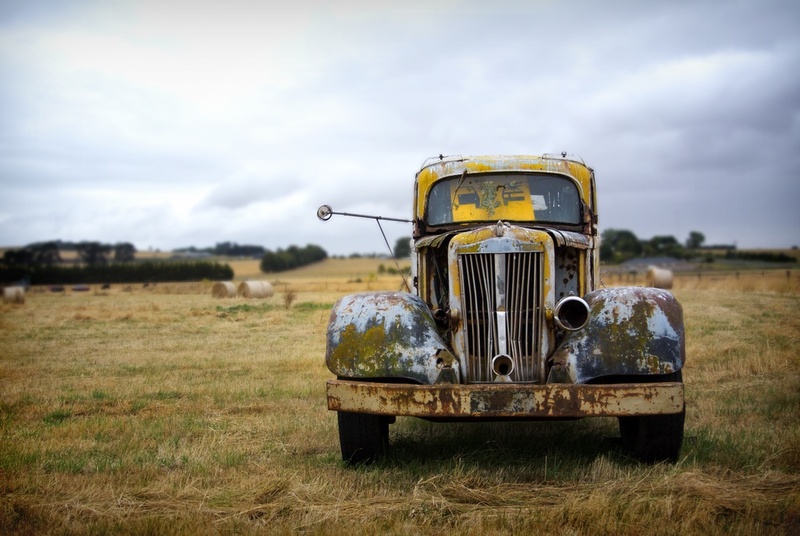 Most teams begin using automation tools like Terraform, Puppet, Chef, and Ansible to provision new infrastructure, but don’t use them regularly to make changes and apply updates once the systems are running. Building and configuring a new system from scratch is fairly easy. But writing definition files and scripts that will run reliably across a large number of existing systems is hard. Chances are, things will have changed on some of those servers. For example, if you have a dozen web servers serving various websites, some sites will have needed an additional plugin or two, configuration tweaks, or even system packages. Problems will have cropped up and been fixed on a few of the servers, but not others. The little differences and inconsistencies that accumulate between servers over time are Configuration Drift. Configuration drift makes it unlikely that a Playbook, Cookbook, Manifest, etc. will run reliably over all of the servers, which leads to the Automation Fear Spiral. This prevents teams from using automated configuration as effectively as they could. So a key part of any team’s infrastructure management approach is how to make changes to existing servers. A good automated change process should be easy and reliable, so that making changes outside the process - logging in and installing a package, for example - just feels wrong. I summarize four models for updating servers in chapter 4 of the infrastructure book, and use them throughout. As with any model, this is just a convenience. Many teams will do things that don’t quite fit any one of these models, which is fine if it works for them. The purpose of this is to give us ideas of what might work for us. Each of this is explained in a bit more detail below. Ad hoc change management makes changes to servers only when a specific change is needed. This is the traditional, pre-automation approach - log into a server, edit files, install packages, and create user accounts. It still seems to be the most common approach even for people using automation tools like Ansible, Chef, and Puppet. People write or modify a configuration definition and then manually run the tool to apply it to a subset of servers. They don’t run the configuration tool unless they have a specific change they want to make. The problem with this is that it leads to configuration drift and the automation fear cycle, exactly as described above. Often, some servers can go a while without having the automation tool run on them. When someone finally does try to run it, the number of changes made are so large that it’s almost guaranteed that something will break. Configuration synchronization repeatedly applies configuration definitions to servers, for example, by running a Puppet or Chef agent on an hourly schedule. This happens on all servers, regardless of whether any changes have been made to the definitions. Doing this ensures that any changes made outside of the automation are brought back into line with the definitions. This discourages ad-hoc changes. It also guarantees that every server is up to date, having had all of the current configuration definitions applied. Regularly applying configuration to all servers also speeds up the feedback cycle for changes, and simplifies finding and fixing problems. When someone rolls out a new change, for example applying a security patch, they can be confident it is the only change being made to systems. This gives them a smaller area to look for the issue, and lower impact for fixing it or rolling it back. Configuration synchronization is probably the most common approach for teams with a mature infrastructure as code approach. Most server configuration tools, including Chef and Puppet, are designed with this approach in mind. It’s important to have good monitoring that detects issues quickly, so any problems with a definition can be flagged and fixed. 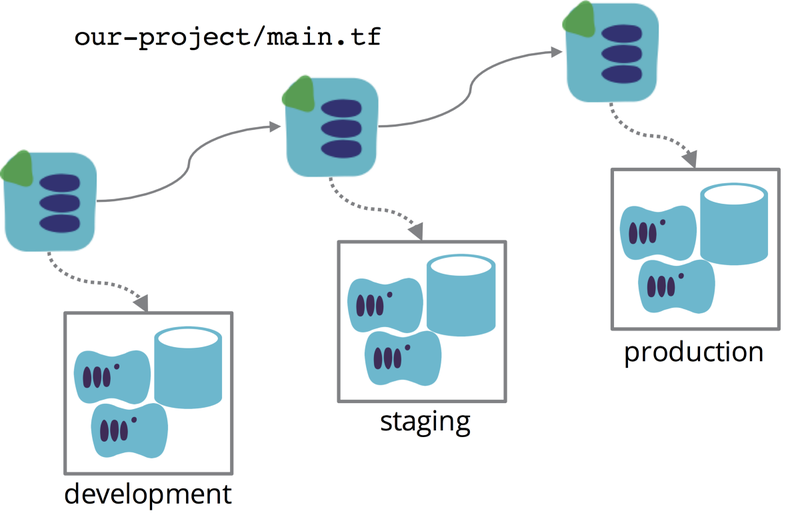 A change management pipeline, similar to a Continuous Delivery pipeline, can be used to automatically deploy changes to a test environment and run tests before allowing it to be applied to production. 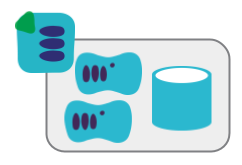 The main limitation of configuration synchronization is that it’s not feasible to have configuration definitions covering a significant percentage of a server. So this leaves large parts of a server unmanaged, leaving it open to configuration drift. 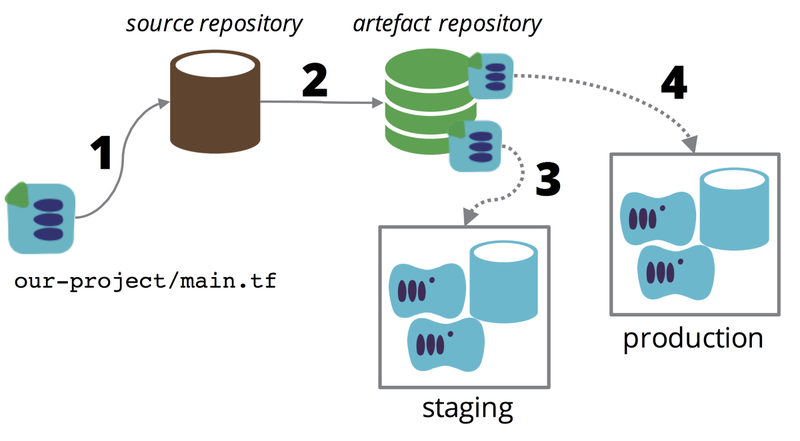 Teams using Immutable infrastructure make configuration changes by completely replacing servers. A change is made by building a new version of a server template (such as an AMI), and then rebuilding whatever servers are based on that particular template. This increases predictability, since there is little variance between servers as tested, and servers in production. Immutable infrastructure requires mature processes and tooling for building and managing server templates. Packer is the go-to tool for building server images. As with configuration synchronization, a pipeline to automatically test and roll out server images is useful. Containerized services works by packaging applications and services in lightweight containers (as popularized by Docker). This reduces coupling between server configuration and the things that run on the servers. Container host servers still need to be managed using one of the other models. However, they tend to be very simple, because they don’t need to do much other than running containers. 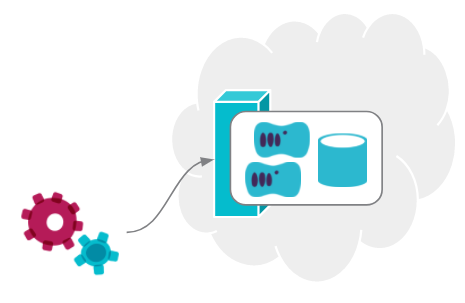 Most of the team’s effort and attention goes into packaging, testing, distributing, and orchestrating the services and applications, but this follows something similar to the immutable infrastructure model, which again is simpler than managing the configuration of full-blow virtual machines and servers.